In this thoughtful, mesmerizing tale with echoes of Station Eleven, the author of An Uncommon Education follows a group of survivors thrown together in the aftermath of two major earthquakes that strike San Francisco within an hour of each other—an achingly beautiful and lyrical novel about the power of nature, the resilience of the human spirit, and the enduring strength of love. Among the disparate survivors whose fates will become intertwined are Max, a man who began the day with birthday celebrations tinged with regret; Vashti, a young woman who has already buried three of the people she loved most . . . but cannot forget Max, the one man who got away; and Gene, a Stanford geologist who knows far too much about the terrifying earthquakes that have damaged this beautiful city and irrevocably changed the course of their lives. As day turns to night and fires burn across the city, Max and Vashti—trapped beneath the rubble of the collapsed Nob Hill Masonic Auditorium—must confront each other and face the truth about their past, while Gene embarks on a frantic search through the realization of his worst nightmares to find his way back to his ailing lover and their home. Typically, I'm a fan of all things multiple perspective, but All Stories are Love Stories was a perspective too many for me, so much so, that I was skipping past the lives of people I didn't really care for. With a character-driven story line propelling it forward, this was a novel of the lives affected by the catastrophes happening outside of crumbling walls. It was an overly, albeit poetically, descriptive narrative that took it's time getting to the action, because the action wasn't what really mattered. We open with impending doom. A countdown to be exact. An EXACT countdown to paint an even clearer picture: "seven hours, fifty-two minutes, and thirteen seconds..." before an earthquake literally breaks the city of San Francisco. Initially told in the alternating perspectives of choir directer Max Fluerent, baker Vashti Shirah, and geologist Gene Strauss, we are given backstories, and present day play-by-play. When all hell breaks loose, these stories eventually merge into one perspective, as the characters meet, and link chains with more people in the city. All Stories are Love Stories was, for me, exactly what it's title advertised. It was a mashup of stories that shared common ingredient. It was a showcase of the way the important things have a way of surfacing amid the scariest moments of our lives. Why is it so hard to act on our impulses when we're not in danger of NEVER being able to again? How deeply broken are the pieces of ourselves that we were convinced were on the mend? This novel took a look at the many ways those questions could be answered. But I wasn't all that interested in what everyone involved had to say. I'll admit that I was definitely more interested in Max and Vashti's exploration of their past, and the way they were handling this current crisis together. I skipped forward to their scenes, and devoured their emotional outpourings. I played the fly on that crumbling wall. There were so many ways to fall in love with the idea of this book though, and probably so many more ways to actually love everything that was in it. I took what I needed to away from it, but I predict that there will be so much more that YOU get out of it. Recommended for Fans of: Contemporary, crisis situations, The Last Policeman series by Ben H. Winters. Elizabeth Percer is a three-time nominee for the Pushcart Prize and has twice been honored by the Dorothy Sargent Rosenberg Foundation. She received a BA in English from Wellesley and a PhD in arts education from Stanford University, and completed a postdoctoral fellowship for the National Writing Project at UC Berkeley. She lives in California with her husband and three children. 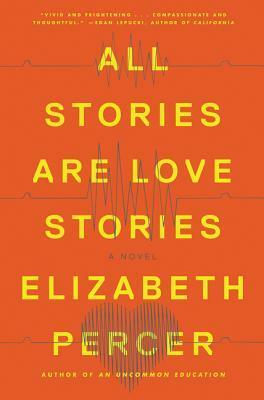 All Stories Are Love Stories is her second novel. Thank-you to Trish at TLCBlogTours, and Harper for sending me a print copy to read, and review for this tour! Thank you for sharing your thoughts as part of the tour. Why does it say "Find out more about Billie..." beside a picture of Elizabeth Percer? It has now been fixed. I really hope this is not the author, trolling.